A revolution is occurring in the way U.S. consumers shop for everything from vehicles and homes to sheets and laundry detergent. Shoppers are moving their business online to take advantage of more competitive pricing, greater selection and shopping convenience. According to ComScore, online consumer spending has been increasing steadily over the past two years with the past five consecutive quarters exhibiting double-digit growth. But it wasn’t until online sales of $49.7 billion trumped in-store sales during the 2011 holiday season that business owners started to see the handwriting on the wall. Record online sales during last year’s fourth quarter heralded a permanent shift in American purchasing habits from brick-and-mortar stores to the internet’s virtual marketplace. In 2011, ecommerce in the U.S. reached a record high of $161.5 billion, a 13% increase over the previous year. Many are calling December 2011 a tipping point. Fueled by exponential smartphone and tablet computer sales, market watchers are predicting that consumer shift from traditional to digital sales will become increasingly more rapid. The change in consumer spending habits is already forcing a concomitant shift in advertising dollars. Advertisers are following their consumers onto the internet, decreasing their investment in traditional print advertising and increasing marketing budgets for online display and banner ads. In 2011, U.S. online advertising expenditures totaled $39.5 billion, an amazing 23% increase over 2010, according to a recently-released eMarketer study. eMarketer predicts that online ad spending will surpass spending on print advertising before the end of the year and continue growing. By 2014, eMarketer expects online ad spending to reach $52.8 billion and hit $62 billion by 2016. As more advertising moves online, newspaper and magazine ad spending will continue to decrease. By 2016, eMarketer expects online display and banner ads to be pulling in twice as many advertising dollars as print and magazine advertising combined. Forward-thinking RV dealers are already beginning to shift their marketing emphasis from print to online advertising. Online display and banner ads offer RV dealers advantages not found in print advertising. 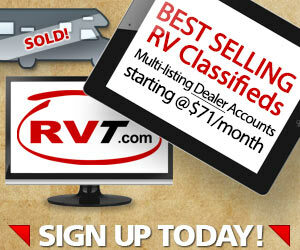 For example, display and banner ads on RVT.com can be targeted to reach any RV-related demographic. RV dealers can target their online ads to a specific RV type, make or model or ads can be targeted to a certain city, state/province or region. 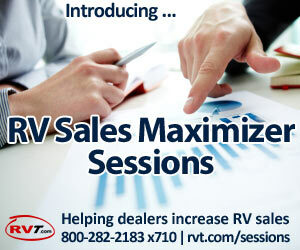 On RVT.com, your online RV dealership ads reach only the RV shoppers you want to reach, and detailed reporting allows you to track the effectiveness of each ad. RVT.com’s online advertising program puts the powerful Google DFP system and the massive Adwords network to work for your RV dealership. In the past 30 days, RVT.com welcomed nearly 400,000 unique visitors who generated nearly 4 million pageviews and 30 million ad impressions. You can’t get that kind of exposure from print advertising. 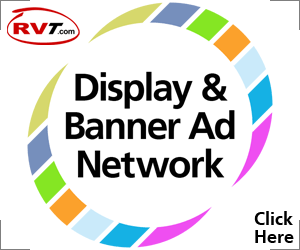 Adding RVT.com display and banner ads to your multi-listing classified advertising program is a smart way to build your brand, target preferred customer demographics, increase traffic to your dealership website and RVT classified ad listings, and, most importantly, increase sales.